Duluth North Pier Breakwater Light, originally uploaded by pmarkham. 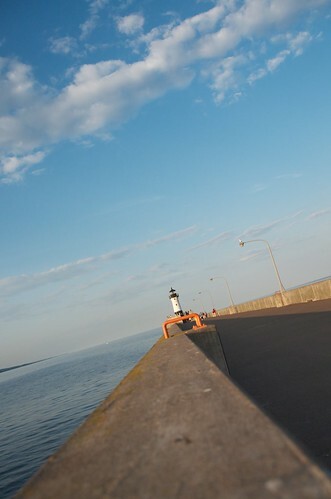 As I mentioned last week, Duluth is a favorite spot for me. This photo of the North Pier Breakwater Light was taken on the same trip as last week’s ship photo. The lighthouse on the North Pier was completed in 1910. It currently displays a flashing red light. The red color comes from red panels that surround the original 5th order fresnel lens. What I like about this photo is the perspective. I purposely had the horizon not level and the camera almost resting on the top of the breakwater wall.